Tool presets let you save a variety of settings and are very handy and efficient for accessing the tools you use most often. That way, the tool is already set with the desired properties, such as colour, line thickness, whether to enable Draw Behind or Auto Flatten mode, and so on. You can create presets for these tools and many more: Brush, Pencil, Eraser, Rectangle, Ellipse, and Line. First, select a tool, adjust the properties, and then create a tool preset for it. Once you have created a tool preset, you can always make adjustments to fine-tune it, as well as create a keyboard shortcut for it. What's the difference between a tool preset and a brush preset? 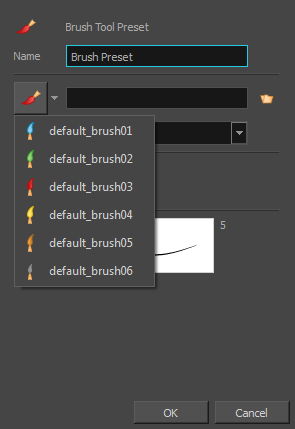 When you save a tool preset, you have the option of saving the colour, which you cannot do with brush presets. ‣ From the top menu, select Windows > Toolbars > Tool Presets. 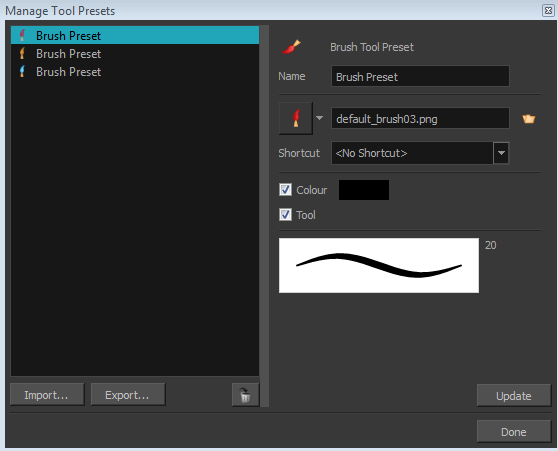 In the Tools toolbar, select a tool, for example the Brush tool. Use the Tool Properties view to customize the tool. To set a specific colour for your preset, in the Colour view, select the colour swatch to link to the tool. Note that when using this preset in another scene not using that colour palette, upon selecting this new preset, a colour recovery dialog box will appear asking to add this colour to your scene. In the Tool Presets toolbar, click the New Tool Preset button. In the New Preset dialog box, in the Name field, type a name for your new preset. From the icon list, select an icon to quickly identify your preset or upload your own by clicking the File button. (Optional) From the Shortcut menu, set a keyboard shortcut to quickly access your preset. By default, the shortcuts are unassigned. To assign a keyboard shortcut, go to the top menu and select Edit > Preferences > Shortcuts > Tool Presets (Windows/Linux) or Stage Advanced > Preferences >Shortcuts > Tool Presets (Mac OS X). When you select any of the following options, they will take effect when you use the tool preset. If an option is deselected, then using a tool preset will not override your current settings. 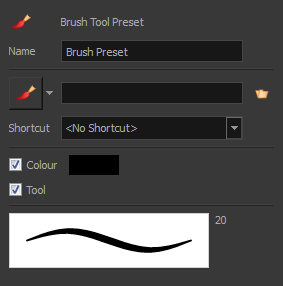 ‣ In the Tool Presets toolbar, click the tool preset icon you assigned when creating the preset. Note that when using this preset in a new scene not using the assigned colour swatch, a colour recovery dialog box appears prompting you to add the colour to the scene. The Manage Tool Presets dialog box opens. 2. In the Select Folder window that opens, locate and select the preset(s) to import and click Select Folder. In the Export Brush Presets window that opens, click Export. To update the colour of your preset, you must first select it in the Colour view. In the Manage Tool Presets window that opens, select the tool preset from the left side. Make any changes you want to the preset.